Since these birds are so rare and close to extinction, only the most experienced breeders with great resources at their disposal should even attempt to breed these parrots. There may also be laws against, or special requirements for, keeping these parrots in your country / area. The legalities need to be verified with the authorities in charge of endangered species. More information about legalities of owning endangered species. 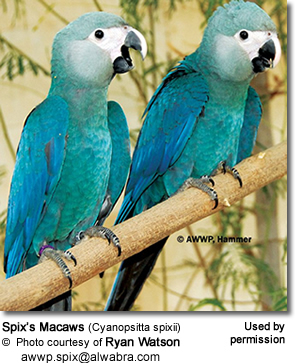 Spix's Macaws are energetic and noisy parrots with inquisitive and playful personalities. They can get aggressive, even outside the breeding season. Wild-caughts are initially shy, but usually get used to their caretakers quite quickly. Once acclimatized, they are quite hardy. In spacious flights, they can be kept in groups outside the breeding season. They have strong beaks and are enthusiastic chewers and need a regular supply of fresh branches and tree stumps both for entertainment as well as to keep their beaks trimmed. They enjoy bathing as well. Accommodation: They require very large planted flights with adjoining shelter. Wood construction is not recommended for macaws, as they are heavy chewers and would destroy the flight quite easily. A metal structure with strong mesh is usually chosen for such birds. The aviary should be situated in a quiet area away from destructions that other could impede breeding efforts. They should not be exposed to temperatures below 20°C (68°F). Plenty of perches should be available in both the inside and outside areas. Breeding in captivity has been regularly achieved in the last few decades by the experienced teams of caretakers that are typically assigned to rare birds. Unlike the wild counter parts that have elaborate courtship displays, there doesn't appear to be any such courting for captive birds. 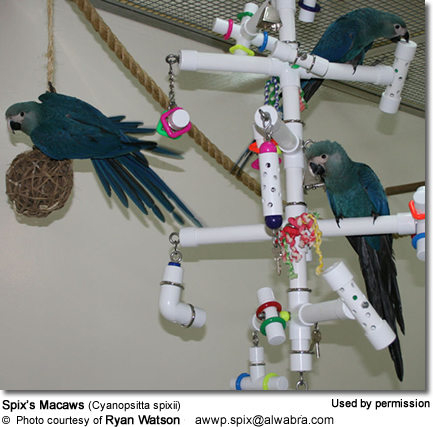 Signs that a pair of Spix's Macaws are successfully paired include extended mutual feeding and preening, longer periods of treading (5 to 10 minutes) and increased aggressiveness towards their caretakers. Position the nest box ornesting stump to allow for easy inspection from outside the aviary. Parrots hatched and raised in the wild are likely to favor nesting stumps rather than nest boxes, as this is what they are familiar with. A typical nest in captivity would be a tree stump that is about 35 cm (14 ins) in diameter and 70 cm (28 ins) high with entrance hole that is 4 inches or 10 cm in diameter. The average clutch consists of 4 - 7 white eggs that are laid in two day intervals. Not all eggs are fertile. The female incubates the eggs for 25 - 28 days, and the male feeds her regularly throughout the day. During the nesting period, it is essential to allow them to be undisturbed, as they might otherwise damage or destroy their eggs or small chicks. In the wild, the chicks fledge the nest when they are about 2 months old and the parents will continue to feed them for another 3 months. In captivity, however, the eggs are usually pulled for incubation, or the young are pulled out of the nest to be hand-raised by their keepers. It is typical procedure to band the chicks' legs and implant microchip transponders to help with identification and recordkeeping. Spix's Macaws are monogamous and mate for life after elaborate courtship displays at the beginning of the breeding season. Curiously, no courting whatsoever has been observed in captive birds. Most breeding activities have been observed between November and March, varying slightly according to the incidence of rain. Nesting may occur as early as September. Spix's Macaws are believed to breed only once a year. The copulation is said to last between 2 and 3 minutes, and is performedside-by-side. During the mating, both the male and female remain on a perch with one leg of the male (typically the right) mounted on the back of the female’s rump (lower back). They typically nest in the hollows of the dead crowns of craibeira trees (Tabebuia caraiba) and perhaps other trees. If possible, pairs used the same nesting hole for breeding year after year. Locals reported that one traditional nesting cavity was used by Spix's Macaws for over fifty years. It is not known whether it was the same pair or whether different pairs used this nesting site in different years. The average clutch size consists of 2 to 3 white oval shaped eggs (4 up to 7 eggs incaptivity), which are laid at two-day intervals. The eggs measure about 41.3 x 30.6 mm (1.63 x 1.20 inches) and weigh 20 grams (0.7 oz) when laid. They are incubated by the female alone for about 25 - 28 days. During this time, she is regularly fed by the male. The chicks hatch blind and almost naked, with only little feather down. The chicks have much smaller crops than the chicks of other macaws of a similar size. Therefore, their parents have to feed them more frequently. Both parents are very protective of their eggs and chicks and will either aggressively defend them, or -- if threatened -- the parents have been known to lie on the ground on their sides to draw attention away from the nest. The chicks leave the nest (fledge) when they are about 70 days old, but they will continue to be fed by their parents for another 100 and 130 days. The young gain reproductive maturity when they are about 7 years old. Unfortunately, in most cases, nesting is unsuccessful, as the eggs and the young were often taken by poachers or predators. Since the parents generally reused each year, they were particularly susceptible to poaching, as the poachers would return each breeding season. In 1957, some introduced African Honey Bees (Apis mellifera scutellata) - also commonly referred to as the "Killer Bees" - escaped from a research facility in Brazil and spread like wildfire in the tropics. These aggressive bees competed with the macaws for cavity nests, and attacked and occasionally even killed breeding Spix's Macaws in their nest holes. (CITES) and the Rhinoceros and Tiger Conservation Act. In 1967, Brazil banned the export of its native wildlife. 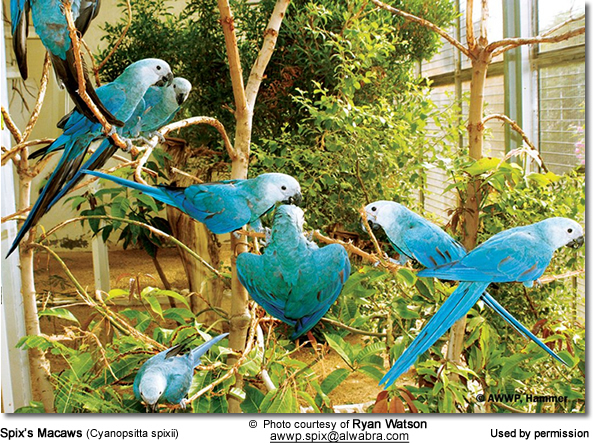 All the Spix's Macaws in Brazil are considered property of the government. Those maintaining these parrots have agreed to manage their birds as part of one global population, under the oversight of the Committee. The Endangered Species Act of 1973 (amended in 1982 and 1988) is one of the world's toughest environmental laws. This law makes it illegal for Americans to import or trade in any product made from an endangered or threatened species unless it is used for an approved scientific purpose or to enhance the survival of the species. Also, the endangered species on this list cannot be hunted, killed, collected or injured in the United States. Convention on International Trade in Endangered Species (CITES) of 1975. As of 2007, this treaty, signed by 172 countries, lists over 5,000 animal species and over 28,000 plant species that cannot be commercially traded as live specimens or wildlife products because they are endangered or threatened. Unfortunately enforcement of this treaty isn't great. Convicted violators often pay only small fines and member countries can exempt themselves from protection of any listed species. Also, much of the illegal trade in wildlife and wildlife products goes on in countries that have not signed the treaty. From July 1st, 1975, the Convention on the International Trade in Endangered Species (CITES) prohibited all international commercial trade in Spix's Macaws between countries that had ratified the Convention. 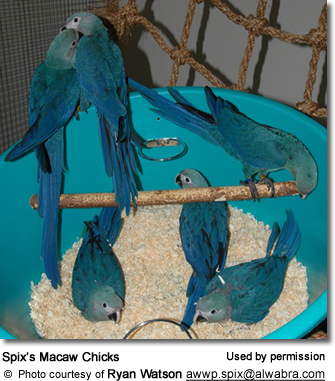 To trade or sell a Spix's Macaw from one U.S. State to another one would require federal permits.